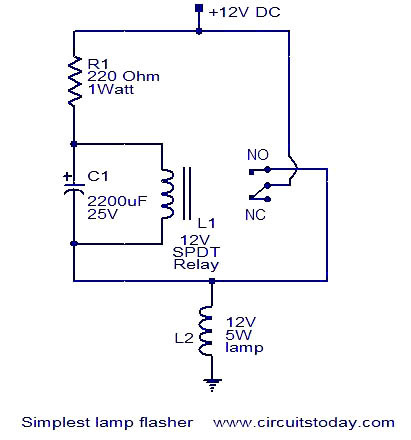 This is a very simple lamp flasher circuit that uses only three components (a capacitor, relay and one resistor) other than the lamp. The working of the circuit is very straight forward. When the power is switched ON the capacitor C1 charges through the resistor. When the voltage across the capacitor is sufficient, the relay switches ON and the lamp connected via the normally open contact of the relay glows. The relay remains energized until the capacitor discharges and then the lamp extinguishes. The charging and discharging cycle of the capacitor gives a flashing effect to the lamp. The relay L1 can be a 12V SPDT relay. The lamp L2can be a 12V, 5W lamp. The frequency of flashing can be varied by changing the value of C1 and R1. please,I want more application regarding to simpler lamp flasher circuit?Also what is time required for charging and discharging of capacitor? i need an flaher ckt which works with 9v. Hi Elgardo the circuit is meant for 48 volt bulb only. or use two 24 volt bubls in series. if you have only 12 volt bulb use four in series. ok thanks a lot, but what about the lamp, the 12 volts, 5 watts lamp will surely get busted when 48 volts is fed through relay contacts, can I insert another 1k, 5 watts resistor between 48 volts and the 12 volts lamp? Hi Edgardo replace the relay with 48 volt relay and increase the R1 from 220ohms to 1k 5 watt. use 63 volt or 70 volt capacitor instead 25volts. Hi, how can we have a circuit for this simple flasher to work on 48 volts DC power supply as in battery operated forklifts? I wished to build one basing on this idea.